Drawing upon the work of MR James, both films feature his iconic central figure: an unassuming and orderly academic man with an interest in antiquity is thrust into supernatural peril, thanks to his meddling with ancient artefacts and sacred history. It’s not entirely clear why, in 2005, the BBC suddenly decided to resurrect the Ghost Stories for Christmas series so long after its original run had ended – 27 years to be exact. At the time, supernatural cinema set in and around the Victorian-Edwardian era had ventured only fleetingly into comeback territory (2001’s The Others, set later in the mid-'40s, had done very decent business at the box office, but the brouhaha surrounding its release had since faded), and the long-rumoured film adaptation of The Woman in Black -- which would turn out to be the highest profile period horror film in decades – was destined to spend several more years tumbling around the mill before finally emerging as a viable proposition and getting the green light in 2010. I suspect that it was the success of J-Horror that prompted the BBC's decision. Whilst Japanese horror movies are culturally unique, they nevertheless share many stylistic traits with English period supernatural literature and film, not least slow pacing and a foreboding atmosphere of dread, devoid of noise and bluster. As the Asian genre market had reached something of a commercial zenith by the mid-'00s with the global successes of Ju-on and Honogurai Mizu no Soko kara, I suspect the corporation took advantage of public’s apparent appetite for quietly haunting ghost stories, and the new episodes were born. So how do these recent productions fare in comparison to the excellent older films? Quite well actually, and purists will no doubt be pleased to hear that with the exception of a couple of modern stylistic quirks pertaining to camerawork and editing, both films manage to stay true to the traditional format established in the ‘70s. Peter Harness, the screenwriter who adapted A View From a Hill, is a huge fan of the original series and was dedicated to recreating its feel, the “sparse, washed-out landscapes; the silence; the eeriness and the unobtrusiveness of the music; the dark, ragged menaces”, as he puts it. With respectful minds such as his at the helm, it’s a feast of neo-nostalgia. Once again drawing upon the work of MR James for source material, both A View From a Hill and Number 13 feature an iconic central figure so key to much of James’ work that its inclusion borders on the obsessive: an unassuming and orderly academic man with an interest in antiquity (this could perfectly describe James himself) is thrust into supernatural peril, brought about by his meddling with ancient artefacts and sacred history. A View From a Hill (2005) takes place in the '40s (updating James’ Edwardian setting) and tells the story of Mr Fanshawe (Mark Letheren), a young doctoral archaeologist staying at the country home of his friend, Squire Richards, played by Pip Torrens (the differing social backgrounds of both men results in an interesting subtext about class division that runs throughout the film). 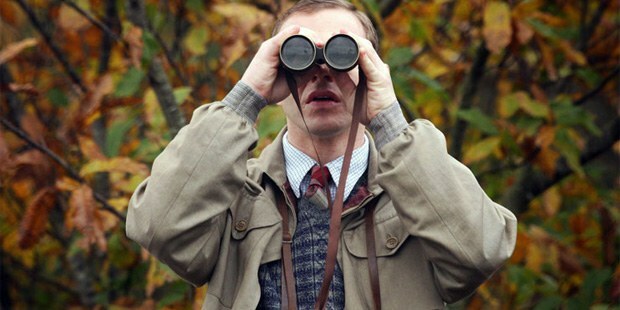 Fanshawe explores the countryside around the house with a pair of borrowed binoculars that belonged to another archaeologist in the area, Baxter, a strange man who died in mysterious circumstances. When Fanshawe begins to see things through the binoculars that appear absent to the naked eye, a terrifying story unfolds of Baxter’s obsession with the executed dead. In Number 13 (2006), directed by Pier Wilkie, a suave Greg Wise plays Oxford academic Professor Anderson, who is staying at a hotel in a cathedral town while he attempts to authenticate some local historical papers. However, Anderson's sleep is nocturnally disturbed by a knocking sound in the mysterious room next door, number 13. Initially choosing to ignore the disturbances, they become so disruptive that the professor has no choice but to open the door and see what's inside. Although contemporary aesthetics are kept to a minimum, the hyperactive tics of modern filmmaking still make an inevitable and occasional appearance, without causing too much damage. Luke Watson, the director of A View From a Hill, seems unable to resist indulging in some frenetic cutting and shaky camerawork, and whilst I understand the notion that frantic shots thrust the viewer into the middle of the action, it seems pointless if you can’t really see what’s happening as the camera whirls around. Such a style also seems incongruous to the spirit of the artistically economic films from the ‘70s, too. Amazingly, in this modern age of overblown CGI effects – particularly in horror films, where the pressure is on special effects to be truly special, I noticed only one obvious but innocuous computer-generated shot, and that consisted of a few suspiciously large crows circling slowly over a field. With the technology available to them, I commend both directors for their restraint. Number 13 in particular is almost charming in its use of primitive but effective scare tactics: disembodied voices; shadows appearing and fading from bedroom walls; a distant spectral figure glimpsed in the half-light of a candle. It could be a Victorian stage play, all smoke and mirrors and practical magic. 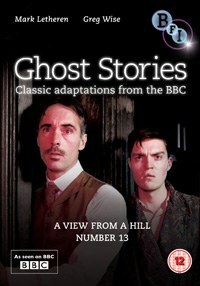 At the time of writing there are no plans to produce any more Ghost Stories for Christmas (though tantalisingly, Harness has a completed screenplay for James’ frightening story The Mezzotint ready and waiting), so viewers would do well to check out Mark Gatiss’ excellent Crooked House anthology series, which is his homage to the Ghost Stories for Christmas episodes he enjoyed as a child. Gatiss, one of the most knowledgeable genre fans working in British television today, would certainly be a suitable figurehead should the BBC choose to dust off the series for one or two final outings; he’d also clearly be sympathetic to the traditional, old-fashioned chills that made each of the earlier films so special. Extras include the wonderful Christopher Lee reading the entire story of "Number 13", and an illustrated booklet with two specially commissioned essays by Jonathan Rigby and Simon McCallum.